Figs & Rouge balm ♥ New handkerchiefs ♥ Nars Turkish Delight ♥ Actual Turkish Delight! 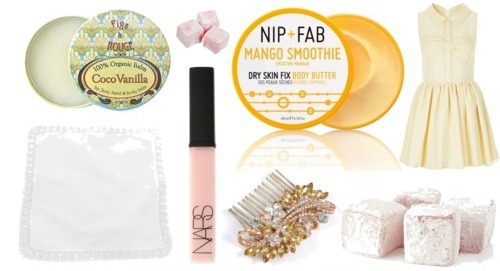 ♥ Nip & Fab's Mango Smoothie butter ♥ New hair comb ♥ Swing dresses! Nars Turkish Delight is a recent addition to my wishlist and I'm saving up my pennies! In the meantime I shall make do with actual Turkish Delight... hehehe. What have you been looking out for this month? I love turkish delight too) Lovely stuff! Thanks for sharing such a nice post! Now following your blog on GFC! Mmmm turkish delight is amazing! You mad made want some now, lol! "Lord, Miss Elizabeth! did you walk here?"